Factory class to generate NWOEBViscousTensorOps. This follows the AMRLevelOpFactory interface. This for introspective load balance. Constructs a factory that builds EBViscousTensorOps with time-independent A and B coefficients. Create an operator at an index space = coarsen(a_fineIndexSpace, 2^a_depth) Return NULL if no such Multigrid level can be created at this a_depth. If a_homoOnly = true, then only homogeneous boundary conditions will be needed. Implements MGLevelOpFactory< LevelData< EBCellFAB > >. 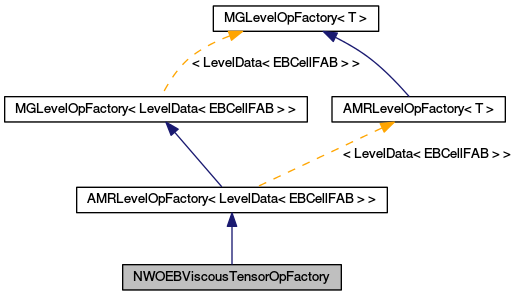 Implements AMRLevelOpFactory< LevelData< EBCellFAB > >. References m_acoef, m_alpha, m_beta, m_eta, m_etaIrreg, m_lambda, and m_lambdaIrreg.